There are two sets of plugs behind the driver kick that travel to another set of plugs in the engine bay to allow for power to pass through the fire wall. Does anyone know where I might be able to get the other ends of the plugs with pigtails? I couldn't find them on any of the online parts suppliers even on the diagrams. I am thinking going to a local dealer will end up with the same results. Maybe an upfitter would have access to them? There is also a plug under the center of the dash some where that that is an upfitter plug for telematics that I wouldn't mind also getting if available. I would be very interested in these plugs as well. Any little bit that can save me wiring. Are the telematics plugs open on the other end as well or is there data on them? Maby it was for the Navi system hookup? From the info I found it looks like the telematics plug is a good spot to pick up info from the factory system and computer. But beyond seeing it in a PDF for upfitters that is all I know and can't find any further info. I haven't had the chance to go digging around in the dash to find it either. Edited by Elfmaze, 25 February 2014 - 03:35 PM. Edited by Jerry, 27 July 2015 - 08:31 PM. I looked at all the manuals, Page 129 didn't show plug numbers on any of them, maybe the manual changed? I have looked every where for the interfacing male plugs to use the Pre-wire harness. The local dealer didn't even know they were there! Anyone have the part numbers for the two 50A two wire plugs and the two 10A four wire plugs? anyone have the plug part numbers ? I never found any mating plug connectors, so I found some large 3/8" female spade wire terminals and made it fit the provided dummie connector that comes provided on the engine compartment side and then just used the same female wire terminal on the inside cab side. I only used the positive wire, I didn't use the negative wire because I just grounded to the chassis when needed. I ran the positive wire to the rear of the driver's side to this fused panel. It is connected to (4) added interior LED lights and provides the two lighter sockets, plus three more switched fused circuits for the future. Yes, there is a plug casing on the engine compartment side, but there are no metal terminals in it to add wires to. Also, the other side of the plug assembly with the wires in it, is not "live", meaning they are not powered, They are only the engine compartment side of the wires that go thru the firewall to the cab. If you look on the cab side, the same two wires go to a different style plug and there is no female plug in that connector for you to use. The terminals are large 3/8" ones that are hard to find, although I did find them. You have to bring a hot "+" wire from the battery (with a fuse) to that supplied connector and add the 3/8" terminal. When you plug those two back together, you will now have a hot "+" wire on the inside of the cab to use however you want. Edited by Randucci, 08 June 2017 - 03:41 PM. For anyone who is looking for the disconnects to put inside the two prong upfitter connector they are 9.53mm female disconnects. They go in with a very satisfying click and don't budge once they are in place. The same disconnects are used on both the engine side and the cab side even though the upfitter connector is different. I'm using them on the cab side as well, just without a upfitter connector until I can find it. Slide them on and put electrical tape around the housing to keep dust and dirt out. 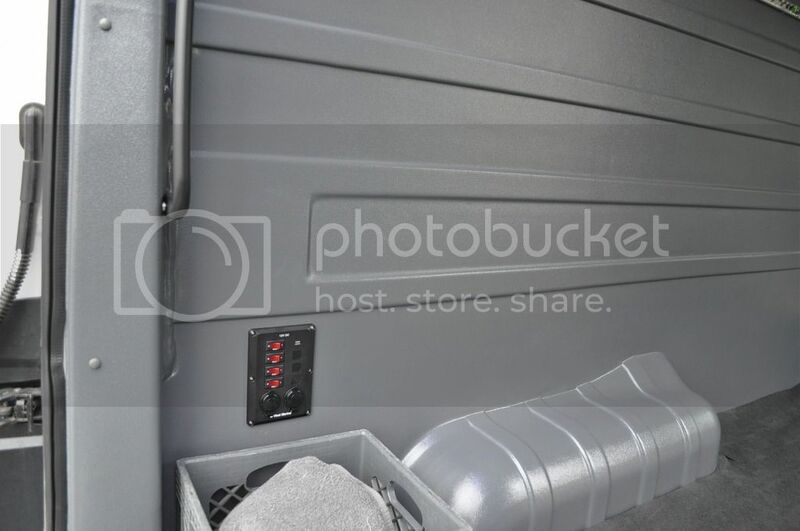 You can use mini fuse tap adapters to connect power on the cab side if you need it. Some things will make sense to connect there and some will make sense to connect on the engine side. Edited by Mdsnyder108, 23 July 2017 - 02:56 PM.